Oriole (the US label not the UK label which is separate) was a budget label that was sold exclusively in McCrory’s chain of stores. This store was one of the many “five and dime” style stores. Records sold for $25 cents. McCrory’s started in Pennsylvania but went out of business in 2002. Manufactured by Scranton Button Company. 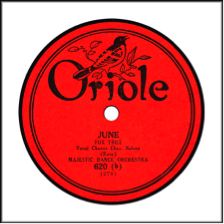 In 1929 American Record Company would take over Oriole. The first Oriole records were black on orange with 1923 displayed. By mid-1924 the 1923 copyright date disappears. The orange label would be replaced in 1927 by a design in gold on black and white. ARC would keep the label colors but shrink the label size. In 1935, the colors change to gold on maroon but retaining the original design. Oriole Records would be dropped in 1938. The label contained my anonymous and pseudonyms. Indeed, Fletcher Henderson record under the pseudonym Sam Hill. Music Genres: Pop, Country, “Race” records, Blues. Record Label: 1924-1927. Orange and black. Record Label: 1927-1935. Gold, black, white color scheme. Notes: The 8000 series are the race records.